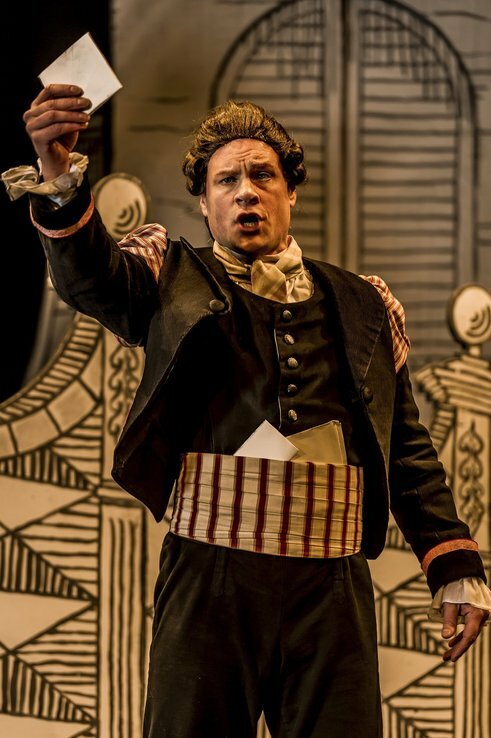 This Andrew Gallagher production, revived by the company’s joint artistic director Brendan Wheatley, is clean and uncluttered, lots of jollity with the characterisations, such as Paul Hudson’s ridiculous Don Basilio and Wheatley himself playing a hilarious Dr Bartolo. His performance is as a singer-actor is completely melded into the role, he really make it his own. Hakan Vrasmo (Above) sang a confident and rather full of himself Barber, fairly swaggering around at times and with a rich baritone that gave a sort of gravitas to his role, between the prettily sung youngsters and character older characters. The voice of older sense Berta, sung by Imogen Garner, was also given a bit of a fun reading with her not only vocally expressing her frustration but also flashing a shocking red ribbon/ garter as she lifted her black, old lady dress.